Efficient, effective preparation for your federal litigation. Make Judicial Perspectives your first stop when researching Federal Judges. Replace anecdotal and incomplete exploration with data that prepares you more efficiently and consistently and gain actionable intelligence to ensure that you are better equipped than the opposition. *Source: Internal audit for Fall 2015. 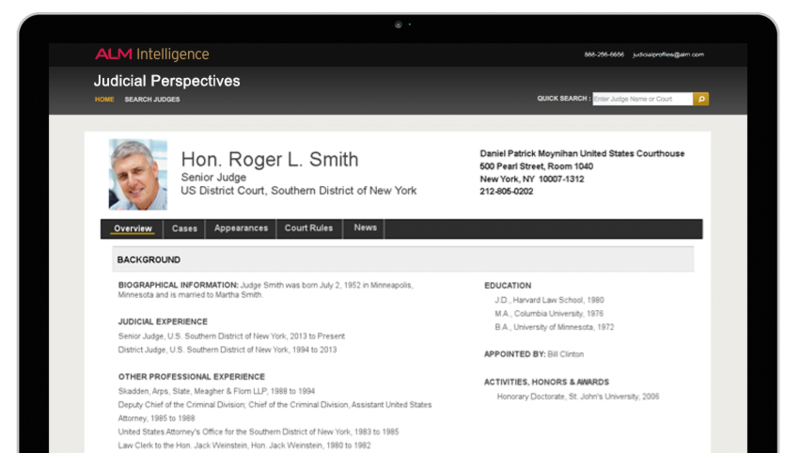 Unprecedented, actionable intelligence—updated daily—to better prepare you for your judge. Access judges’ case histories, biographical information and references in the news, as well as lists of lawyers and firms who have appeared before them in court. Quickly and easily search a robust database based on judge or jurisdiction to fine-tune your trial strategy and gain a competitive advantage over the opposing counsel.